Have questions about gift giving? Email us at info@starkeyfoundation.org or call us at 866-354-3254. Gifts made to Starkey Hearing Foundation are gifts to support the general activities and programs of the Foundation. 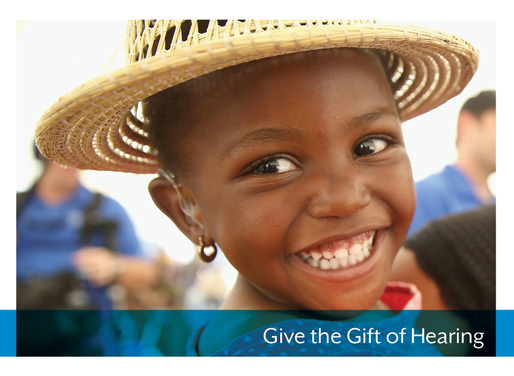 To give the gift of hearing to the greatest number of individuals around the world, Starkey Hearing Foundation does not use its limited resources to track individual donations to specific missions or programs. We use your gift where it can do the most good by combining it with the gifts of others to help as many people as possible each year. Starkey Hearing Foundation is recognized as a public charity that is exempt from Federal income taxation pursuant to Section 501(c)(3) of the Internal Revenue Code of 1986, as amended. Donations are tax-deductible to the fullest extent allowable by law. Hover over the image to view the inside.